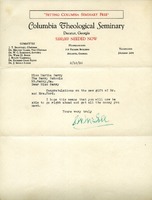 McGill encloses examples of materials that his organization uses to raise funds and offers them to Miss Berry for her use. 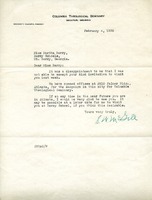 This is a congratulatory letter about the Ford donation from S.W. 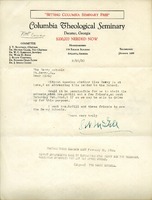 McGill of Columbia Theological Seminary. S. W. McGill writes to The Schools, not knowing if Miss Berry is home. He asks if it would be possible for him, his friends, and Mrs. McGill to visit The Schools on February 22. There is a handwritten note on the back of the paper, saying that due to previous engagements, Miss Berry will be unable to see the McGills. The writer says that they would be glad to have the visitors anytime after Sunday. This note is transferred to type on the front of the paper, marking it as a telegram. 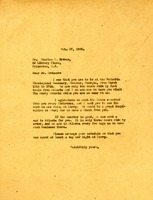 Mr. McGill writes to tell Martha Berry he is sorry that he was not able to accept her invitation to visit The Berry Schools. He mentions that if she is in Atlanta in the near future he would be glad to see her. 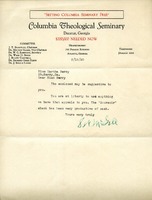 He also gives the address for the campaign for the Columbia Theological Seminary in Decatur. Martha Berry writes about the Ford boom, how it will impact the operating costs, and the need to change the perception that Berry doesn't need support; she also discusses a financial drive to raise money for operation. Clark describes a previous visit to the school and lets Berry know he would be happy to visit again.